The Legal Genealogist deeply regrets the events that have pulled this blog off topic today… but this is just too important to go without comment. Senator Chris Murphy serves from Connecticut. Where 20 children and six adults were killed in 2012, by another madman with another gun. I agree wholeheartedly! We have got to find a way to stop this madness. There are no words to express my sorrow and anger. Thoughts and prayers are not enough. We’ve got to end the gun violence. More Americans dead of mass gun violence so far in 2015 than there have been days this year. This doesn’t happen in any other developed country. Guns are the difference, and removing them from the equation has got to be a huge part of the solution. What can ordinary citizens do, when Congress refuses to act? Thanks for having the courage to name the problem, Judy. It’s not courage to want to protect myself, my family, even my country from this nonsense. Our politicians have got to stop kowtowing to special interests and take care of those of us who pay their salaries (rather than for their campaigns!). Look, I disagree with you on this issue and that is fine. I subscribe to this blog for legal information about genealogy. I am not trying to put my head in the sand but one of the many reasons I do genealogy is because it is one of the few ways I can escape the daily barrage of bad news in our country and around the world. This is one place that I don’t want to be confronted with someone’s views on politics that I may disagree with. But it is your blog and you can run it the way you want. I can choose to read it or not. Brava for speaking out, Judy. Writers should not box themselves in to whatever narrow topic we usually write about. We are multi-dimensional humans, after all. If only the rest of the world recognized we are one human family (like most of the genealogists I know!) then maybe we could come together to solve these horrible cancers in our society. So sad, but no time to wallow in it. Calling senators & congresspeople might seem ineffectual, but maybe it’s the best recourse we have! I surely don’t want to have to go off topic often — and particularly not for this reason. Enough already yet! Whether or not we agree or disagree, I hope every American defends both Judy and Linda’s right to free speech. Its not my blog but every once in a while I see nothing wrong with airing out an issue. After all, that’s what our forefathers fought for! Thanks, cousin Stan — and hey… it’s that old matter of “she who pays the piper calls the tune.” My blog — my rules!! Anybody who really disagrees with me can put together their own blog!! Can we just call it “violence” or “people violence” instead of “gun violence”? The gun didn’t pull its own trigger. We don’t say “car violence” when someone drives a car into a crowded or “fire violence” when someone sets an occupied building on fire. Violence is violence, regardless of the tool used to carry it out. It’s just man’s inhumanity towards his fellow man. That’s a big part of it, yes, but there’s a limit to the amount of damage you can do with, say, fists or sticks. Having a high-powered assault rifle with a multi-shot magazine and fast reload is a whole ‘nother kettle of fish. The couple who committed the violence yesterday also had 12 pipe bombs in their apartment, according to CNN, so they were willing to do far more and could have upped the “amount of damage” to a whole ‘nother level. We law-abiding gun owners also say “enough” to violence and we are heart broken when lives are lost in any senseless manner. But we also know that more gun control won’t solve the problem because the problem is man. Hardly. But the problems of foreign terrorists are being addressed, here and there. It’s our homegrown madmen we’re ignoring — and we’re dying in record numbers as a result. In 1996 in Port Arthur, Australia, a single gunman killed 35 people. The government quickly instituted rather strict gun laws and in the 19 years since there has not been a single mass murder. Google the event to get further details if it interests you. Jim Jefferies (from Australia) also has a couple of youtube pieces on the topic of gun control that are very interesting. (Beware! He is a comedian. The topic is not a laughing matter but he has some valuable things to say). Sigh… I know… I know… This is a distinctly American issue, and problem. Thank you for going off topic and the courteous way you handled the ensuing conversations. This is a critical issue that requires discussion and listening to others’ thoughts. Definitely not a time for resorting to name-calling and diatribes. This is my first post (I think), but I lurk here and enjoy your blog. Completely agreed. It’s extremely disappointing that even the broad supported (via polls that showed the majority of the people in the nation supported) very minimal legislation to expand background checks wasn’t passed by Congress. It seems even the majority of people can agree on some basic small steps yet Congress simply won’t do their job and represent the people (instead fearing gun lobbyists, campaign fund providers, and institutes like the NRA). I’m a firm supporter in democracy, the rule of the majority. If there’s something I want that the majority of the nation wants then fair enough (I didn’t want to war with Iraq for example, but there was broad support at the time for it so fair enough), though when some very basic measures have broad support and can’t get through then we have a major roadblock in our democracy. I’m enough of a lawyer to know that we can’t have pure democracy — the will of the majority could be just plain flat out wrong, as in the issue of slavery or during times of great crisis. But those exceptional cases aside, I agree: it is a travesty when a few ideologues can hold the country hostage to their viewpoints. Perfect quote to illustrate the point. Dear Judy. I heartily disagree. Do you think for one minute that more gun control laws would have stopped what happened yesterday? Why do you want to make politics out of what is really radical islamist terrorism? Did the strict gun control laws in France stop the Parish massacre? You wrote earlier all humans have the same DNA. True it is, but we don’t all have the same religion or belief systems. You preach “peace and love” all day long. They aren’t listening. They don’t care. And they don’t have the least bit of respect for your opinions. Sometimes you really do just have to face reality and realize who your enemy is. It isn’t hard to do when they keep shouting it from the rooftops, guns ablazing (legal or not.) I hope you’ll get a wake up call as to the world around as it is, not how you wish it were. Since the beginning of this calendar year, there have been a whole series of mass murders committed in our country by people wielding assault weapons. All the others were committed by native born American citizens who had no connection to islamist ideologies, using legally purchased weapons. The basic problem in this country is not islamic terrorism, but too many people with questionable mental and moral stability being permitted to assemble arsenals of military grade weapons at will. I’m not against people having guns for hunting, marksmanship competitions, or self-defense, but it seems to me there ought to be a limit to how many guns a reasonable person needs. Futhermore, I am heartily saddened to be stopped today by a custodial worker at a local court house, asking me how I thought the flags looked. I looked out to see they were at half mast. He wanted to know if he had set the US flag at the proper distance above the state flag. I asked him why they were at half mast in the first place. He said because of the terrorist shooting in California. I said he may as well leave them at half mast 365 days a year at this rate. But as to the question, “do they look alright?” NO. THEY DO NOT. We should not be flying flags at half mast 365 days a year because of every terrorist act around the globe. They should fly full mast, and we are not going to be terrorized into submission by these barbarians who happen to have human DNA. And just out of curiosity, how many Americans died this year because of those terrorists you are so afraid of — and how many died because of madmen with guns too readily available? Count ’em up, Craig. Count every last one of them. Then let’s talk about what we need to focus on. I don’t know. I guess the murder rate in Chicago alone would surpass all mass shootings by far. The solution is not taking guns away from abiding citizens. I am curious to know how you think banning gun ownership to law abiding Americans will stop terrorists from shooting people. Are you that naive? Some views from the other side of the Atlantic. In 1996 a man by the name of Thomas Hamilton attacked children at a primary school in Dunblane in Scotland. He was armed with legally-held handguns and killed 17 people in all. The government of the day set up an inquiry and in 1997 nearly all handguns were banned in the UK; a further Act by the next government banned the rest. There were, and are, objections – in part by the various target shooting organisations, which actually need to train overseas. But we have had mercifully few similar incidents since. We do have a gun crime problem but not a big one: there were 30 fatalities in 2012/13, of course in a smaller population than the US. Firearms were involved in 0.2% of crimes, but over a third of those were air weapons, which remain legal. Our police remain for the most part unarmed, indeed not all officers even have Tasers. Politics being “the art of the possible,” I can’t see similar changes happening in the US, although surely some change must be on its way? We can only hope… and vote our consciences on this. Dear Judy, You are one person that I can trust with a knowledgeable answer, I hear or read all the time people calling for stricter regulations but I don’t think any of them know the laws. So help me understand, because i live in Ct and the laws passed after Newtown still would not have stopped the craziness. My army veteran husband went through an extensive background check to apply for his gun lisence, even stepping into a specialty store to do our homework proved extensive, so I need to understand what am I missing? There are places in the US where buying a gun is ridiculously easy and there isn’t even much — or any! — background check if the sale takes place at a gun show. 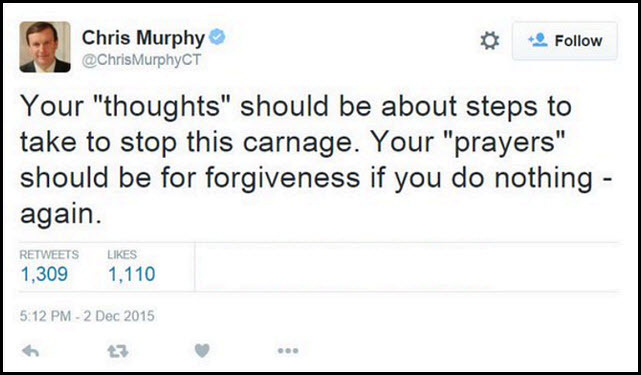 Your CT laws, like my NJ laws, are much stricter than most of the country and, of course, the CT laws became stricter after Newtown. Reactive rather that proactive. So no, your CT laws alone wouldn’t have prevented what happened in CA. But if the laws were the same everywhere, if nobody could legally buy an assault weapon with high-capacity magazines, if we had to prove we were as capable of having a gun as we are of driving a car — that would go a long way towards bringing this craziness under control.